This morning I presented to a select group of CIOs on the topic of consumerized innovation in the enterprise. How, in short words, do IT departments become the go-to people when others in their organisation want to try something new that either relies on off-the-shelf technology, or reaches out on such technology to people outside of the organisation. I’ll be clever, I thought. I’ll present from my phone. The Nexus 5 I got hold of a few weeks ago, along with a £12 “Slimport” cable, will connect to any HDMI screen or projector. I got hold of one of the cables, had a play at home on our two TVs, and everything worked fine. 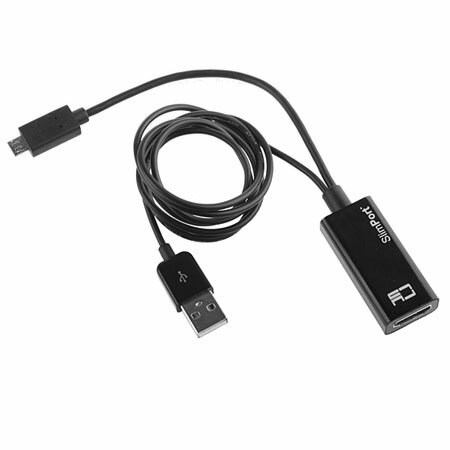 (As an aside, there’s something weird to me about an HD image coming out of a connected as small as a Micro-USB, which shows how much my mind has been impacted by whacking great SCART cables over the years). I also had a backup plan. Although I’d asked that an HDMI display be available, I also knew that plush offices in the City of London are often hard-wired with audio visual equipment and either HDMI connectors aren’t available, or they are wired with a plug, not a socket. Plan B was to access my presentation from the web – it was in Google Docs (you can see it for yourself here). Sure enough, when I arrived into the beautiful conference room on the 14th floor of the modern block looking out over the rising towers of the city, there was nothing but a VGA socket to connect video. VGA is (second only to MIDI) a real zombie standard. Invented by IBM in 1987, and according to wikipedia superseded some 15 years ago by DVI, it’s still the most common connection you’ll find in corporate meeting rooms to hook up to a screen. So to plan B. The meeting room had a hidden PC with a wireless keyboard and mouse. It had working Internet. It, however, had only Internet Explorer Version 8. IE 8 has just celebrated its fifth birthday, and five years is a very long time in Internet years. Especially if you try to use something like Google Docs. Now I’m not placing blame on anyone here. Not the company who had very graciously given us the meeting space for the morning, or their IT department; not Google for not supporting old browsers in their relentless drive to get people to use Chrome; not Microsoft for allowing such fragmentation in their customer implementations. My tribulations kind of proved a point. In the end I had to email a PDF copy of the presentation from my mobile phones Google Drive app, then download the presentation from GMail (which worked on the browser on the PC) to present from Adobe Acrobat. That gap between “plug-and-play” (which worked on both my 6-year old and 5-year old TVs at home) and a convoluted workaround shows quite how far enterprise is behind the consumer curve. For a while now I’ve been suggesting that “Enterprise” and “Consumer” have switched meanings when it comes to technology. Where “Enterprise” used to mean the full, deluxe version, it now increasingly means the limited, part-functioning variety. That’s also the scale of challenge that Enterprise IT has to climb to maintain relevance in this increasingly consumerised technology world.